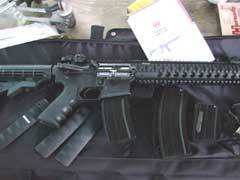 Rifle comes with padded soft case, instructions, three magazines, lock, and sight adjustment tool. 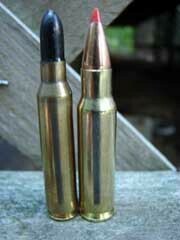 6.8mm SPC cartridge compared to 5.56mm NATO cartridge. 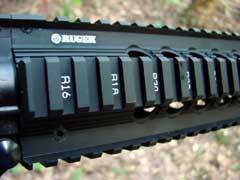 It has been about fifteen months now since Ruger introduced their SR-556 rifle. 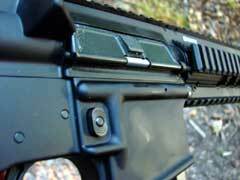 Entering an already crowded AR market at that time, which was near the end of the great AR-15 demand surge caused by the election of Obama as our President, the SR-556 has found its niche in the market. It is a top-tier rifle, using a rugged, simple, adjustable, and reliable gas piston system and high-quality components. The Ruger is priced above many of the other ARs available today, but it has the quality and high-end components to justify the price, and this has been proven in the market. 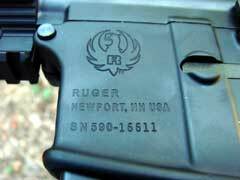 Ruger did not try to cut corners in the production of the SR-556, and many knowledgeable shooters are willing to pay for quality. With the success of the SR-556 chambered for the 5.56x45 NATO cartridge, Ruger has now introduced their SR-556 chambered for the 6.8mm SPC. The 6.8 offers more power for the AR platform, increasing the useful range of the SR-556 for use as a hunting cartridge, and a good case can be made that the 6.8 is also a better round for military, police, and civilian social work as well. 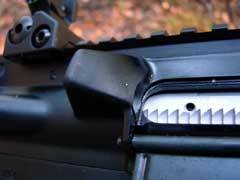 The 6.8 SPC cartridge was reviewed here soon after its introduction in 2004, using the Barrett M468. Since then, its popularity and availability has increased greatly. 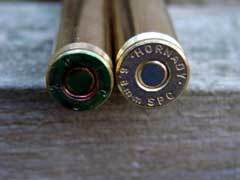 The cartridge is perfectly suited for whitetail deer, at least our Southern variety. The .277 inch diameter bullets that are made specifically for this cartridge are built to expand at velocities lower than the bullets built for 270 Winchester class cartridges. 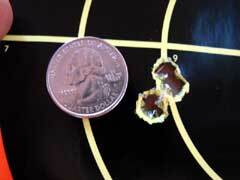 The 6.8 is a very efficient cartridge, and works well in the Ruger SR-556 carbine. 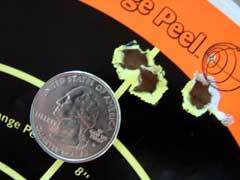 From this Ruger carbine, the Hornady ammo chronographed right around 2570 feet per second, with both the 110 grain V-Max and the 110 grain boat tail match bullet. 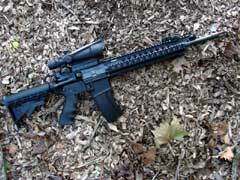 One reason that I really love an AR-style rifle for hunting is that it is so easy to shoot, and to shoot well. The adjustable buttstock allows the rifle to easily fit a young shooter, and can grow with him as his arms get longer. No need to cut a stock off and then later try to lengthen it. 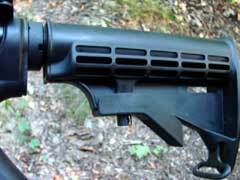 The adjustable buttstock is also handy for us full-grown shooters. It adjusts to fit the situation and the thickness of the hunter’s clothing. The quality and features of the Ruger SR-556 have been covered here before, so I will just hit the high spots in this review, and refer you to the two previous reviews (SR-556 & SR-556C) for further details on the weapon. 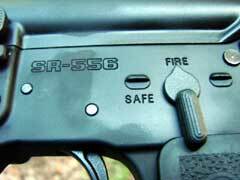 The SR-556 uses a two-stage gas piston system with a four-position regulator that bleeds powder gasses from the barrel to operate the action. The adjustable regulator allows the weapon to function even under adverse conditions, such as temperature extremes and also with substandard ammunition. 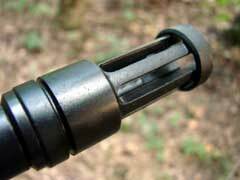 The gas regulator can also completely shut off the gas to the piston to function essentially as a straight-pull bolt action, should the situation warrant such. 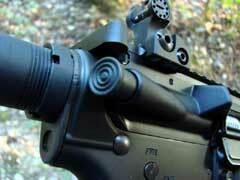 The SR-556 has an excellent set of fold-down Troy battle sights. 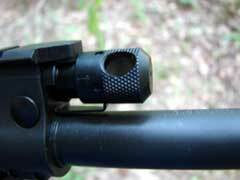 I usually prefer an optical sight on an AR, as my vision is not nearly as good as it once was. 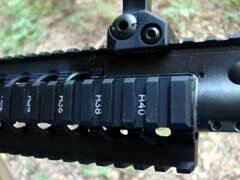 Most of my fighting ARs have a Trijicon ACOG scope on top, and my hunting ARs wear Leupolds. However, back in June of this year, Ruger had a few writers out to the Gunsite Training School in Paulden, Arizona for three days of shooting. 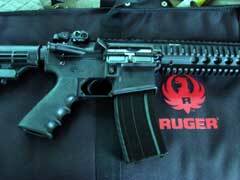 They broke out brand new SR-556c carbines for everyone, including a few Ruger executives. During the three days of shooting, we put thousands of rounds through the weapons. I know of not even a single malfunction of one of those carbines throughout the entire time that we were there. Back to the sights. As stated above, I prefer optical sights, but those Troy sights worked perfectly throughout the course, firing at targets at various distances. The younger folks preferred to use the smaller aperture of the rear sight, but my eyes won’t let me see through that small hole at all. I used the large aperture, and it served me very well at all distances. The Ruger SR-556 6.8 SPC carbines come supplied with one low-capacity five-shot magazine, and two standard-capacity twenty-five round magazines, where legal. 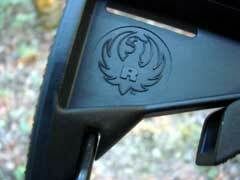 Ruger is supplying C-Products magazines with these 6.8 SPC rifles. Good choice. 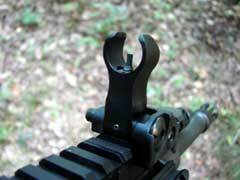 I have several C-Products mags for my 6.5 Grendel, and they are excellent magazines. The magazines supplied with the test rifle functioned perfectly, as expected. Ammunition is much easier to find now than it was a couple of years ago, as the 6.8 SPC weapons become more popular. I found plenty of Hornady 6.8 ammo in stock at Midsouth Shooters Supply. 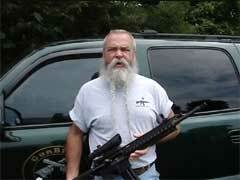 The sample SR-556 is a very handy carbine, with its one-in-ten inch twist 16.12 inch barrel. 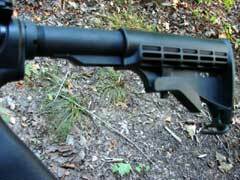 The barrel is threaded 5/8x24 TPI and wears a Ruger flash suppressor. The sample rifle weighed in at 7.75 pounds without magazine, and just barely over eight pounds with an empty standard-capacity magazine in place. 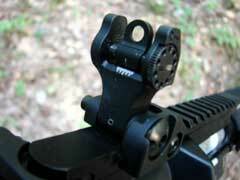 For accuracy testing, I mounted my Leupold “mule” scope atop the Ruger’s Picatinny rail. On that subject, the SR-556 has fifty-one inches of Picatinny rail, providing plenty of room to mount optics and accessories. 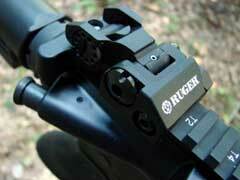 Ruger also provides rail covers to make for a more comfortable grip, if desired. 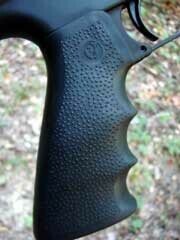 The Hogue pistol grip is very comfortable to use. The Leupold Mark 4 8.5 to 25 power scope allows me to extract the most possible accuracy from a rifle/ammo combination, so it is my “go to” scope that I use whenever I can. Its clear optics and precise adjustments allow me to shoot groups that I think are as good as the capabilities of the weapon and the ammunition. Of course, this is using a quality rest on a solid bench. Accuracy testing was done at my range, with an air temperature hovering around ninety-two degrees Fahrenheit with typical Tennessee high humidity, at an elevation of 541 feet above sea level. 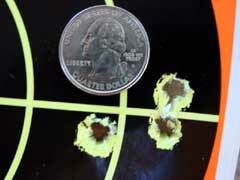 At first, accuracy was pretty good, but nothing amazing, with groups in the one and one-half inch range at 100 yards. Pretty decent accuracy for an AR with a five and one-quarter pound trigger pull, and plenty accurate enough for hunting and social work. I was satisfied with the performance, especially since I was using off-the-shelf factory ammo, with no special load development for this rifle. However, as I kept shooting, the accuracy steadily improved, and after the second day, groups of one inch or less at 100 yards was typical. I fired one group with the Hornady Match ammo that measured less than one-half inch at 100 yards, but it proved to be a fluke, and I was not able to duplicate that again. I really never expected this SR-556 to be as accurate as it turned out to be, but I have experienced this before with other rifles. It sometimes takes a little seasoning of the bore for the rifle to settle in and do its best, and this SR-556 certainly redeemed itself, going from an accurate rifle to a very accurate rifle, again still using the Hornady factory ammunition. This new Ruger SR-556 in 6.8 SPC is the same high quality, accurate, reliable weapon that has been on the market for over a year now, but offers another cartridge option for those who want more power from their AR, without going to a larger, heavier weapon such as an AR-10. 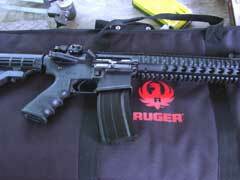 Check out the new SR-556 and other Ruger products online at www.ruger.com. To order the SR-556 online, go to www.galleryofguns.com. 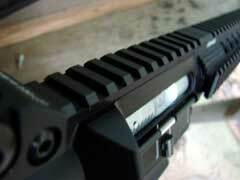 Ruger SR-556 chambered for the 6.8mm SPC. SR-556 has plenty of Picatinny rail for optics and attachments. 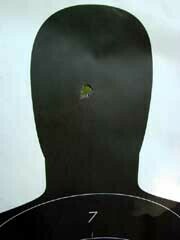 Five shots at fifty yards. 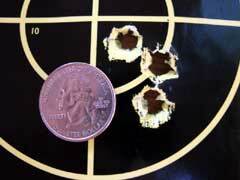 Typical 100-yard groups ran in the one-inch range, although one group measured less than half that.